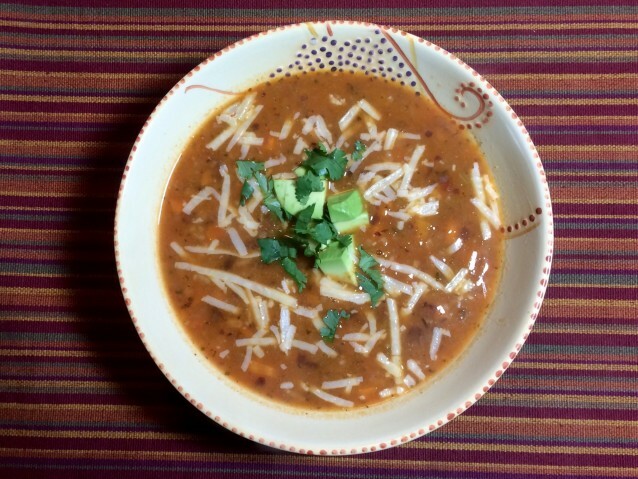 This is a filling soup with flavours of Mexico and the Southwest. Corn flour can be found as masa harina or maseca at the grocery store. We use corn masa (Maseca) for corn tortillas so we have it on hand but you could crush up some corn chips and add them when you add the chicken stock. Heat 2 tbls of oil in a large pot over medium heat and saute onions and cilantro stocks adding the garlic for the last minute of cooking. Transfer to a food processor adding the can of tomatoes and one portion of the black beans. Process until smooth. Heat another 2 tbls of oil in the large pot over medium-low heat. Add the contents of the food processor along with the corn flour, cumin, coriander and cayenne stirring until thickened. Add the chicken stock, carrots and corn. Bring to a boil and simmer until carrots and corn are done. Add the other portion of black beans and the rice and simmer a few minutes longer. Season with salt and pepper to taste. Ladle into bowls and garnish with chopped cilantro, avocado, cheese and lime juice. Serve with corn chips which can be crushed into the soup as you would do with crackers. This soup can have a couple of boneless, skinless chicken breasts added along with the carrots and corn if you desire.